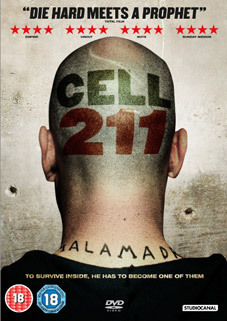 Engaging and intense, Daniel Monzón's gripping prison drama Cell 211 (Celda 211) swept the board at the 2010 Goya Awards, where it was nominated for sixteen prizes and won eight, including Best Film, Best Director and Best Actor. Inevitably a US remake is already in the works, with Paul Haggis of Crash slated to write and direct. Described by Jamie Kermode over at Eye for Film as "a striking piece of work that will leave you reeling," Cell 211 will be released on UK DVD and Blu-ray by Studiocanal on 9th January 2012 at the RRP of £15.99 for the DVD and £19.99 for the Blu-ray.